A contemporary story of sibling rivalry set north of the Arctic Circle in a First Nations community. The eponymous characters are a First Nations brother and sister pair who live in a small Inuit community on Arviq Bay, rendered in a detailed map on frontmatter pages. After the children get into a minor squabble fueled by some airborne snowballs, their grandfather encounters them on the tundra and talks with them about inuksuit, rock formations with practical and spiritual importance to their ancestors and to the Tuniit people, who predated the Inuit. Putuguq and Kublu listen to his words, adding in their own comments and questions, and then Putuguq ends up making his own inuksuk to hide behind in order to take playful revenge on his sister. 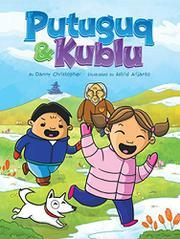 This turn of events contradicts the message embedded in their grandfather’s earlier praise for Putuguq when the little boy resisted chasing after Kublu for laughing at him because his pants split to reveal heart-dappled underpants. At the same time, it also humanizes the contemporary First Nations characters, making them accessible to readers. Further enhancing this sense of accessibility is the layout of the book, which adopts comic-book conventions such as panels and speech balloons to deliver the story and employs a brightly colored cartoon style that seems influenced by a Japanese manga style. Endnotes provide more information about inuksuit and the Tuniit people.